We bring you today a giveaway for a $30 gift card to Starbucks, thanks to Memfy.com. Check them out and see what Coasahmom.com has to say. They are the "I" in the paragraph below. 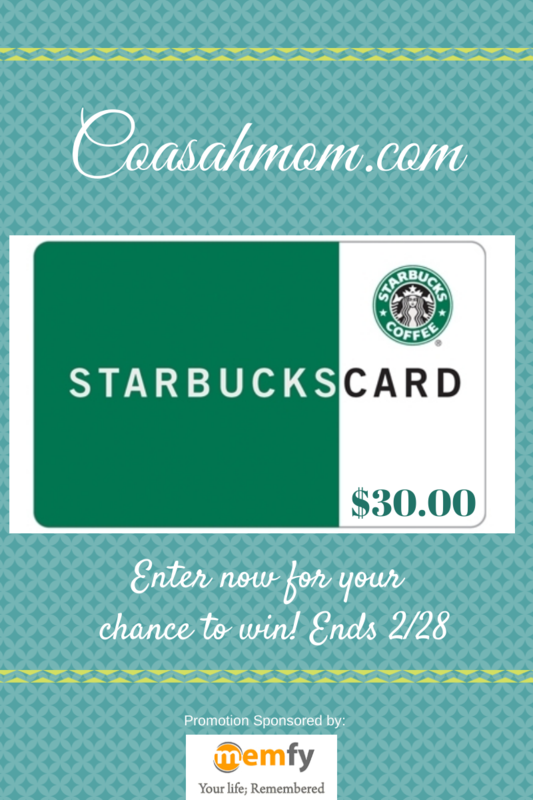 Enter before 2/28 for your chance to win and remember life happens over coffee. Social sites are popping up left and right, some are good and some are bad, and some are good enough to really make the cut. The ones that get to stick around are the ones that offer something unique to their users. For example Memfy.com allows the user to achieve different aspects of the site; they may create posts pertaining to only special memories or create posts to keep their life straight and remember those important dates. 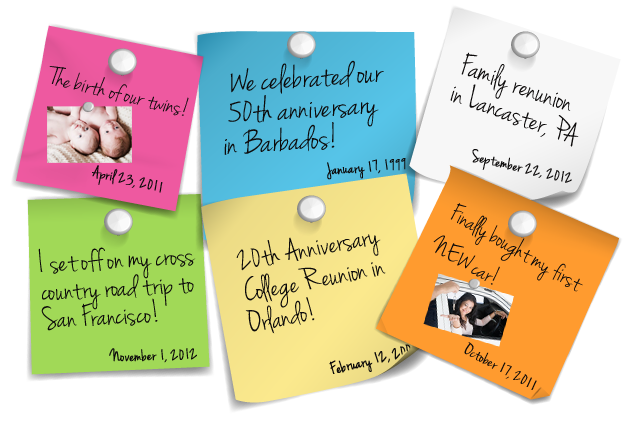 By adding friends and family they are then allowed to share these memories and also learn of their friends and family’s memories as well. There are several different ways that the site itself can be used and to me that’s what completely makes it more unique than others. Because of this, I personally believe that we could all benefit from Memfy.com in one way or another. I do like Memfy, but I don't think they can win over the people who use Facebook for the same purpose if not the same format. Think it would be more for guys then women but it seems like a cool idea. My first time signing up! looks interesting! Think it would be more for women then guys but it seems like a cool idea. I think it's interesting, but not something I would use. I think it is great for organizing your life and trying to remember certain dates. I definitely think more women would use it than men! I never heard of it until now. I think I will look into it. Personally, I probably would not use Memfy, mainly because I mostly use Facebook and Twitter, but it's an interesting new concept. I think Memfy.com is a fun way to record memories--and share them with others! I've never heard of it - but it sounds neat! I have never heard of this before. It looks like Twitter crossed with Facebook. I already use too much social media so it don't interest me. I have never heard of it and probably wouldn't use it. It's just another social media site and I think there are enough of them already. I have not heard of this, but I like a place that has all of your memories/occasions/dates in one place. It sounds interesting and I definitely want to look more into it. Not sure if it would be something that would benefit me at this point in time, but I can see potential for using it down the line. I have never heard of it before but it seems like a great place to write down memories and share with close family and friends! I wish I had Memfy when my daughter was born to track her milestones and funny comments. I think it could take off. It may not be as big as facebook but you never know. Facebook started out small, just like myspace did. It is different but I don't think it is something I would use. it's okay but I don't think it will be very successful. Although it seems interesting, it wouldn't be something I see myself using. I don;t think I will use the site very much. I think it is an interesting idea, but I don't think I would take the time to update it (I mean lets face it I haven't updated my personal info on facebook since college-about 6 years ago). I am sure some people would really enjoy it though! It's interesting but I don't think I would use it. Memfy is a great idea to keep track of upcoming events. It's a good idea but not something I'd use as I use my calendar in my email to track important information. since Memfy can hold those little moments of joy, comedy and sadness it would be useful to scrapbookers and Journal keepers. Good idea. I never heard of it until now. I think it will be very good. I think it's an interesting idea, though not something I find particularly useful for myself. This is my first time hearing about this. It isn't my cup of tea but it looks like a cool idea. I'm not sure what I think yet...give me time. Looks like something that would interest me, however I need to read some more! So this sounds really cool if I would remember to write in it! I dont think I would use it. Anything that might help me remember and track all the little things and important dates piques my interest, but it seems like it's just too involved for me to really get into - if I could just work out the old fashioned pen and paper (and keep it all in one place!) then I would be just fine. I think it's a great way to document and journal personal experiences and memories, especially since you have the option of keeping your entries private versus sharing them with friends and family. I'd most likely use it for private reflections and stick with other social media like Facebook or twitter to share events with others in my social network. I do think it would be a good way to keep track of your life if you didn't want to use Facebook, or keep it public. I never heard of it before but I will check it out. Something I would never use. Sadly, there are way too many hackers out there that could use the information in a negative way. Guessing passwords or pretending to be someone they are not. Sorry. I honestly don't think I would use it. I'm not sure ho it's really different from the apps I already use. I don't think I'd use it. I only use most of the social sites I have now just for entering contests. I keep a separate account for my personal contacts and I don't really seem to use it much either! I am not really one for posting much about my life online. I do have a Facebook account but I only post maybe a couple of times a month. I usually just scroll the postings to keep caught up on what my family and friends are doing. I will, however, check out the site and give it a chance. Thank you for another super giveaway opportunity. Please keep up the terrific blogging. First time hearing about it. I will have to check it out. It's interesting, but I'm hooked on facebook. This is the first I have heard of it. I am not sure it is for me. I think it's sounds wonderful, being a person who more than just easily forgets so many things this would be A OK with me to help me remember so much. I probably would not use it. I think I've got enough sites I belong to that offer similar services / functions. I've never heard of it but it sounds fun! I don't know how often I would use it though. I really think it's a cool way to share memories! Thanks for hosting! I had never heard of Memfy before. I would have to check into it more closely before I could give a real opinion of it, but my first concern is this...is it destined to become another Facebook?? I haven't heard of Memfy until reading this post, but it sounds great to remember important dates that I often forget! I have never heard of it until today. It seems interesting but i am not sure if I would ever use it. I like it - another tool we can use to document our lives! I think it's an interesting idea, though not something I would use for myself. I think it is a good plan but nothing I'm interested in. The timeline is a neat idea. It is an interesting idea. I Don't know if I would use it though. I'm more into reading blogs than having my own social media space, to be honest. If it becomes popular enough for the kids to tell me about it, we will see. Not my thing, but for people who are into that, would probably be good. I think its cool and something unique, but not for me. It's a good way to document everything. It's handy as I tend to forget things easily. It sounds like a neat idea. It is something I probably would have used in college, but not now. It's new to me, probably wouldn't utilize it. Memfy sounds like a very useful, organizing concept. I'm not sure how much more of this type of thing we really need, but it's at least as good as anything else I've seen. This is the first I've heard of Memfy. I didn't know what it was really until I started reading your blog and played the video. Anymore, who knows what going to take off to be popular. It's that unique idea that seems to really take off. I never heard of Memfy before, but I think it would be a great way to set up reminders and share memories. I had not heard of it. It seems like a pretty neat site though! I had not heard of it before and do not think it would be useful for me, but we are all different and am sure many find it helpful. Looks interesting. Will have to look into it more. i think i will have to check into it further, very interesting. i am tony l smoaks on rafflecopter. I think it's different and allows you to really reminisce on the past! Seems like a clever site. I'm not sure if I'd use it. I find it interesting but I am not sure if it is something I would use. I think the site is interesting but I don't use social media that much so I don't think I would use it. I have never heard of it before, but just by first impression, I don't think it's for me! This is my first time hearing about this. There are already many social networking platforms, so I'm not sure if this would get lost in the shuffle. However people are always looking for something new. I would use it if my friends did. It sounds great. I hope it remains simple. I'm not really sure- I think we're all so busy already with FB, Twitter, Pinterest, etc so another site will have to be really special to cut it. Could go either way. It seems like it would be useful if I remember to go update things and keep track of them. It seems great to help keep track of things going on. I don't think I would use the site, but I think it could be helpful for people who don't keep track of important dates. Not all of my friends are on Facebook, so I forget the birthdays of some of them (terrible to rely on technology for something like that, I know). This site looks like it could be helpful w/remembering all birthdays, and other important dates too. This is my first time checking it out. It looks interesting. Very cute idea! Kind of like short journal entries that mean the most to you. Thanks for the giveaway… I do not think that I would have a use for it. This social media looks interesting. I don't know if I would use it.